When it comes to picture books, I can almost always predict how a story is going to end. My critique group tells me I have a natural knack for writing endings so that definitely could be part of it. Like most people, I want an ending to have an element of surprise, while still bringing a sense of completion. I adore endings where the story cleverly takes you full-circle, and you find yourself saying, “What?” and “Of course!” simultaneously. 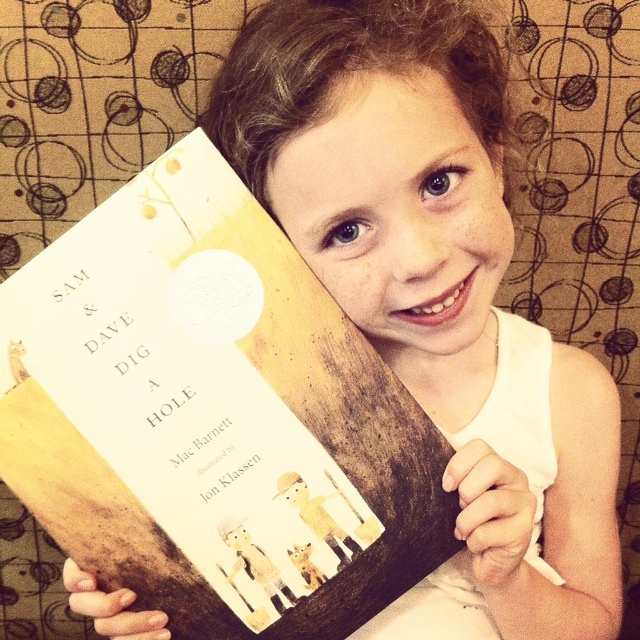 So I found myself a bit unnerved when I read SAM AND DAVE DIG A HOLE, one of this year’s Caldecott Honor books by Mac Barnett and Jon Klassen. The ending had me flummoxed. Wait, what just happened? What does it mean? Am I not smart enough to understand the ending of this book? My daughter, Lily, laughed and laughed as she turned the pages. “The dog knows!” she giggled. And then, as she reached the final pages, she looked at me quizzically. “What was that?” she asked. 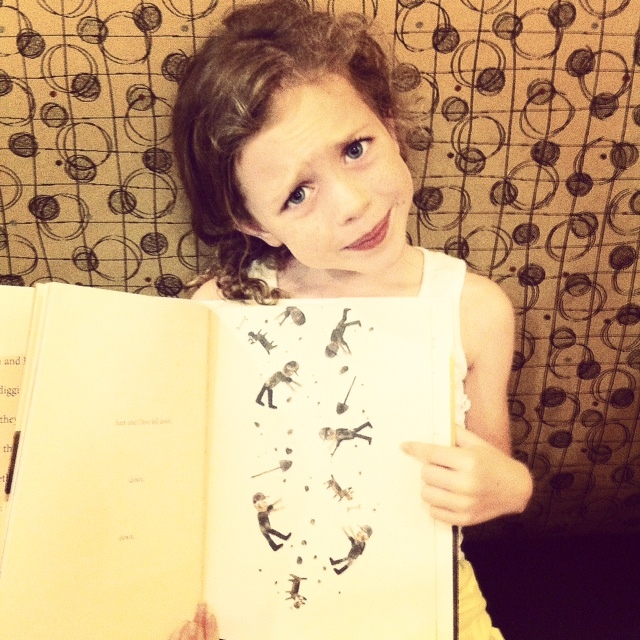 As a writer, I relate to this picture book in a big way. Sam and Dave are going to dig until they find something spectacular. They don’t draw up plans. They don’t sketch out the approximate area of the backyard and choose prime digging sites. They don’t google the types of treasure found in that area and estimate how deep they might have to go to find it. They just dig. How many days have we, as writers, tapped the squares of our keyboards, pawed through the soft dirt…writing, digging, hoping to find something spectacular? And on their journey, Sam and Dave don’t have any idea how close to treasure they are. The reader gets to see through the illustrations, that if they would just dig a little deeper, they would get there. I found myself shouting at the pages, “Keep going! Keep digging! You’re sooooooooo close!” But always, just before they strike the spectacular, Sam and Dave decide to change direction, to split up, or just to stop digging altogether. It’s easy to draw the parallels to our writing world, isn’t it? Sometimes, we feel so close, and hopeful that with one more revision, one more query, we will get there. This story, THIS STORY, will be the one that lands us a contract. But when it doesn’t, what do we do? Do we change direction? Maybe the treasure is just a little more to the right of where we are. Maybe my chapter book needs to become a middle grade novel. Maybe my girl character needs to be a boy. Maybe I need to chuck the whole thing and start over. Maybe I need a break!?!? If Jon Klassen were to illustrate our journey, what would we see? Would we see the colossal diamond within our reach, if we just keep digging? Or would we see a never-ending depth of soil? We query. And as the responses roll in (or not) we find ourselves analyzing every word that comes our way. We find ourselves asking…wait, what just happened? What does it mean? Am I not smart enough to understand how to succeed in this business? And that’s the beauty of Sam and Dave; the beauty of an ending that doesn’t provide answers. We may be within striking distance, or we may not be. But the thing that keeps us going is the very real possibility of discovering the spectacular. The only way to find out is to keep digging. Haven’t read Sam and Dave yet but it must be spectacular just like our desire to write a spectacular novel and to just keep digging when we seem to hit bottom. Very thought-provoking. Thanks! I still need to read this.